Of course, you can get an engagement ring with any gemstone you like. Which is to say that even though this post is all about birthstone engagement rings, there’s no rule mandating that March girls stick to aquamarines and July girls stick to rubies. Just keep in mind, though, that some gems are better suited for engagement rings than others. Putting aesthetics aside, and speaking strictly in terms of practicality, here’s the deal: The higher a stone’s rating on the Mohs scale of mineral hardness, the more durable and damage-resistant it is. This is an important consideration for a piece of jewelry you’ll be wearing day in, day out and hope to pass on to future generations. Still, the heart wants what it wants, so you if you’re absolutely enchanted by a particular ring, you might just have to go for it. From garnet (January) to tanzanite (December), your birthstone engagement ring is just a click away. Best known as a semi-precious gem with a rich, wintry red hue, the finest garnets in the world come in other shades, offering brides-to-be born in January an entire spectrum of options. Look for tsavorite (electric grass green), spessartite (bright orange) and rhodolite (a vivid magenta hue); the Malaya garnet above, found along the Tanzania/Kenya border, has a unique pinkish-orange hue, and just look how it pops in 18k rose gold. Raise your hand if purple was your favorite color as a young girl, a proclivity that made you fall hard for amethyst. Sometimes old habits die hard, and the best amethyst rings will reveal a sparkling, true purple-jelly-bean hue (not lavender like the ones you used to buy at Phish shows). One of the very best reasons to get an amethyst engagement ring is that you can go quite big without breaking the bank. Amethyst is also a stone associated with the goddesses Venus and Diana, as well as St. Valentine himself, and therefore imbued with messages of love, sensuality, femininity, and affection. Serene, sparkly and available in a range of pastel-to-swimming pool blue hues, aquamarine is a bridal-friendly alternative to a traditional diamond that feels perfectly on point (hello, “something blue!"). And while not as hard or chip-proof as a diamond, its rating of 7.5 on the Mohs scale isn't too shabby. If you were born in April, that diamond engagement ring better be something out-of-this-world fabulous! Many of us believe that emerald-cut diamonds, with their elegant, Art Deco-ish, “block of ice” look, showcase a diamond’s beauty in its most ideal form. Or How About a Yellow Diamond? If you’ve been receiving dinky little pieces of diamond birthstone jewelry as gifts since you turned 12 and the glamour of this stone has somewhat faded for you, remember that diamonds come in many colors (including glorious yellow, as in the example above) and, a favorite of many brides-to-be, pink. Some jewelry experts say that emeralds chip easily, but technically they have a decent hardness rating (7.5-8 on the Mohs scale). As long as you handle your emerald engagement ring with care, there’s no reason not to give into this luxurious option, a symbol of fertility, love, and fidelity. It was also the engagement ring gem of choice for Jackie Kennedy and Wallis Simpson—talk about cred! As fragile as pearls are, there's no denying the romantic appeal of their luster and luminous glow. A symbol of purity and innocence, a pearl is an acutely feminine engagement ring choice. Fun fact that may sway you: Anne of Green Gables had a "circlet of pearls" for her "troth ring." And here's an important PSA: Clean with a damp cloth only - absolutely no chemicals allowed! With its magically bright red hue, it's no surprise that ruby is considered the stone of love and passion. According to Beth Bernstein, author of the book, If These Jewels Could Talk..., "The glowing intensity of the ruby suggests an inextinguishable flame burning in the stone and radiating out to ignite love." Ruby also rates very well on the Mohs scale—9—making it not just a wildly glamorous engagement ring choice but a practical one, too. It doesn’t get any more all-American than peridot, for the lion's share of it is mined in the state of Arizona. Which may be reason enough to consider an engagement ring with a peridot center stone. A few more: The uplifting lime green hue, the comparatively affordable price tag and the fact that peridot is believed to have healing properties. It’s also a symbol of renewal that offers hope, protection and good luck to the bride who wears it. But there’s a caveat: Like pearls, peridot is another super-fragile birthstone that’s very sensitive to chemicals, not to mention rapid changes in heat. 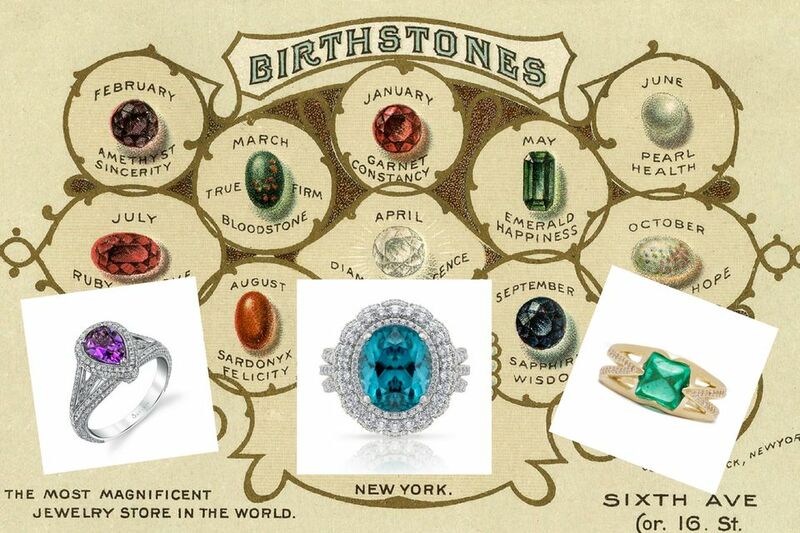 So the jewelry trade is a fan of declaring new birthstones for certain months - not so much to replace the traditional stone, but to offer die-hard jewelry junkies an alternative (and often more luxurious) option. So if you're born in August and peridot’s very specific chartreuse hue is not appealing, you’ll be pleased to know that the American Gem Trade Association has named spinel as the second official birthstone for August babies. Not familiar with spinel? It’s dreamy. As the sister stone to ruby (it’s harvested from the same mines), it likewise comes in vivid reds but rarely fetches a price tag quite as dear. More good news: In addition to red, spinel comes in oranges, pinks, blues, lavenders, and mauves and can serve as a protective amulet. Like ruby, sapphire is a member of the corundum family, which means it, too, has a Mohs scale rating of 9, making it an excellent stone for an engagement ring. Most of us associate sapphires with the color blue, and the most desirable sapphire engagement rings display a glorious shade of cornflower blue. Since the practice of heat-treating gemstones to achieve an appealing color profile is pretty common (and should always be disclosed), one way to ensure your sapphire is all-natural is to go with an antique engagement ring, such as this Victorian cluster style or this cabochon dome ring or this stunning circa 1950 design. 14k recycled rose gold and pavé diamond ring with an Australian opal center stone, $1,825, S. Kind & Co.
You’ll often see pink topaz in antique jewelry dating from the 18th and 19th centuries, a variety that hails from Brazil. But the majority of topaz on the market today is enhanced (read: heat treated) to take on the most exquisite blue shades, from soft sky blues to the magnificent London Blue variety shown above. Topaz occurs naturally in golden yellow shades and should not be confused with citrine, which, although considered an alternative November gemstone, is simply not as rare. Topaz also has a higher Mohs hardness than citrine (8 vs. 7), thus making it a more practical option for your engagement ring’s center stone. Like sapphire, topaz comes in white—well, technically we call this “colorless”—offering brides yet another, more affordable alternative to diamond that comes from nature (not a laboratory). A turquoise engagement ring would be such a unique choice. For starters, it’s an opaque stone (so no facets to make it sparkle), but you can ramp up the engagement ring potential of a turquoise center stone by pairing it with diamonds. Turquoise also emits naturally patriotic vibes, as much of it hails from Arizona, New Mexico, Nevada, California and Colorado. Finally, turquoise is a stone associated with faithfulness and happiness, making it the perfect symbol for a couple on the marriage track. Some bummer news: Like other birthstones covered in this post, turquoise is super porous and needs to be treated with care, so do your best to avoid contact with chemicals and cosmetics. Please do not confuse this stone with cubic zirconia! Though it likewise exhibits exceptional fire and brilliance, zircons are found in nature. Colorless varieties are available, but vibrant blue-green variants are particularly stunning (zircons also come in red, pink, yellow, brown, orange and an array of earth tones). Mined in Thailand and Cambodia as well as Vietnam, zircon was added as an official December birthstone alternate in 1952. And it’s a hard stone (6.5 to 7.5 on the Mohs scale) but its facets have been known to chip—so be sure to give a zircon engagement ring a little extra TLC. The most luxurious jewel in December’s birthstone trifecta, tanzanite was added as yet another December birthstone alternate in 2002. An exotic, abundantly coveted stone, it’s beloved for its intoxicating hue—a vivid blue with violet undertones. Found exclusively in the foothills of Tanzania’s storied Mt. Kilimanjaro, tanzanite has only been available since its discovery in 1969. Its unique beauty, coupled with its rarity, makes it particularly worthy of an engagement ring.